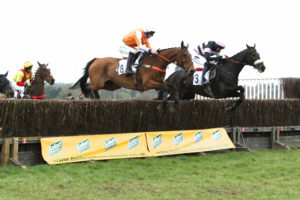 Quote of the day from the Essex with Farmers and Union Meeting at High Easter came from jockey Rupert Stearn in the closing stages of the Maiden race in which he is reported as saying “Oh no, not you again!” to friend and rival jockey Richard Collinson as the pair battled to line for the third time that day. Both jockeys were on fine form and had three great tussles up the run in and both finished the day with a double a piece. 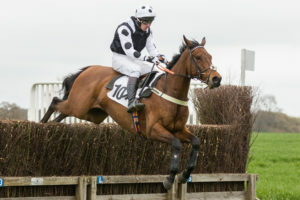 It was Rupert Stearn who came out on top in the Maiden race when forging clear after the last to take the spoils on Oakidoaki, who is owned and trained by his parents Simon and Penny Stearn, by two and a half lengths from Collinson on board the Andrew Pennock trained Un Huit Huit. Oakidoaki was having only his second start for the Stearn family and they thought he might need this run to get him fully straight but he was given a superb ride from his jockey who bossed the race from the get go; setting a steady early pace Stearn was given the run of the race and was able to quicken for home from four out and he was never going to be caught as his mount stayed on strongly up the run in allaying any fitness doubts. 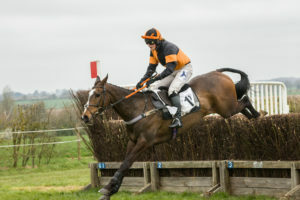 The Stearn family are East Anglian Point to Pointing stalwarts and were very popular winners on the day. Rupert’s other winner had come earlier in the day in the 3m6f Conditions race aboard Franks A Million who is owned and trained by another great East Anglian pointing family, the Turners. 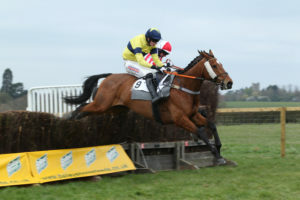 This time he took the race from Collinson who was on board favourite Mahlers Spirit. Both Collinson and trainer Edward Turner were hugely complimentary of the ride Rupert gave the horse as he tracked Collinson for the majority of the race before getting a great jump at the last and riding a strong finish to get up by just a length on the line. Whilst Collinson was somewhat frustrated by these two seconds and a second in the closing hunt race he couldn’t help but be thrilled with his two winners Laser Beam, who won the Intermediate race, and Chapelier who held on by just a neck to win the 2m4f Conditions race. Chapelier might not have been as impressive as in his previous three wins but Collinson reported that he “didn’t really love the quick ground and just did what he had to in a trappy race” and this was nonetheless the horse’s fourth win from four runs! Intermediate winner Laser Beam was impressive and Collinson described him as “a lovely horse who is just getting better and better.” Both winners were trained by Andrew Pennock who is having another fabulous season and this was Laser Beams third win on the bounce. The meeting also saw the running of the East Anglian feature race the Ladies Open Warwick Vase which was taken for the second year in a row by the wonderful 12 year old Don’t Do Mondays. 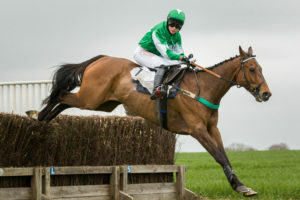 Trained in Kent by Libby Lawson he was last seen finishing seventh in the Foxhunters at Cheltenham in March. 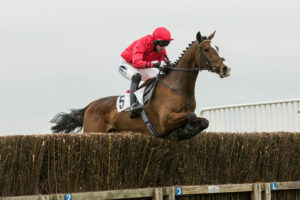 This time partnered by jockey in form Izzie Marshall who said “he jumped round foot perfectly, enjoyed making the running and was never over taken”. Whilst there were only four runners in the race it was nonetheless a competitive affair but Don’t Do Mondays clearly loves this track and pulled away gamely from the last to take the race by an impressive 6 lengths from another Edward Turner trained runner, Kriss William who was ridden by his wife Rosie. The loudest shouts of the day came in the closing Hunt Race as Quick Oats, partnered by Jack Andrews, and Chosen Rose, another for the Collinson and Pennock team, provided a wonderfully exciting finish which saw them battling all the way up the run in. In the end it was Quick Oats and Andrews who came out on top by ¾ length to give owner trainer Nigel Padfield an incredible ninth consecutive win in the race. 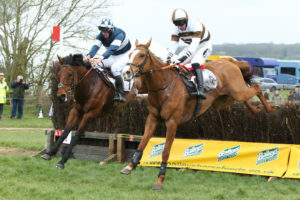 It also provided some tonic for Andrews who had taken a heavy fall at the final fence in the previous race. The continued drying weather conditions meant Clerk of the Course Simon Marriage had a very busy week in the lead up to the meeting but the overwhelming feeling on the day was that he had once again done a brilliant job of watering to get the ground even and just on the quick side of good. He was rewarded with an enormous crowd who enjoyed a great atmosphere and some really good racing.